Throw in a dash of audiobooks during errands and running. Result? MUCH more fun reading. Chunky: The Stand, by Stephen King. Yes, still reading and it is GOOD. Short: The Unlikely Pilgrimage of Harold Fry, by Rachel Joyce. I love it. Quiet grief and a sweet old man walking to save a good friend's life. I have a lump in my throat with every page. Audio: Daughter of Smoke and Bone, by Laini Taylor. Pretty cool so far, and the narrator is fantastic. So then you asked, "Coffee and a Book Chick, any revelations?" Why yes. Yes, indeedy. Taking my timmmmmeeeeee (time) is wonderful. Reading The Stand's 1,000+ pages has been a lovely and lounge-like reading experience. I'm enjoying savoring the story and taking my time, devouring the pages in this summer heat. In the past, I would flit through books so quickly that I felt like I had to re-read certain sections to make sure I didn't miss something. Now, I'm taking time and jotting progress notes on Goodreads. Love it. Keeping this up. Reading like this makes me want to keep going in exactly the same way all the time. I want to have one chunky book to read leisurely, and then take books that are shorter (at around 300 to 400 pages). Taking breaks and reading a shorter book makes me not feel like I normally do when I read a wicked long book, which is a feeling similar to *this-book-has-to-end-soon-so-I-can-read-something-else-before-I-go-crazy. * Even if the chunky book is amazing, it's still a long book, you know? Then, having the audio really changes it up. Don't Forget! To keep the three selected books extremely different genres, so there is no confusion. So, what's next? I think I have my next chunky book picked. Ready...? Bleak House by Charles Dickens. I've never read his work before, and since Gillian Anderson starred in the BBC mini-series, Bleak House, I thought I'd read the book first, natch. (I first became a fan of hers because of The X-Files, but have you seen her in the movie The House of Mirth? I loved the book by Edith Wharton and I thought Gillian Anderson was amazing as Lily.) 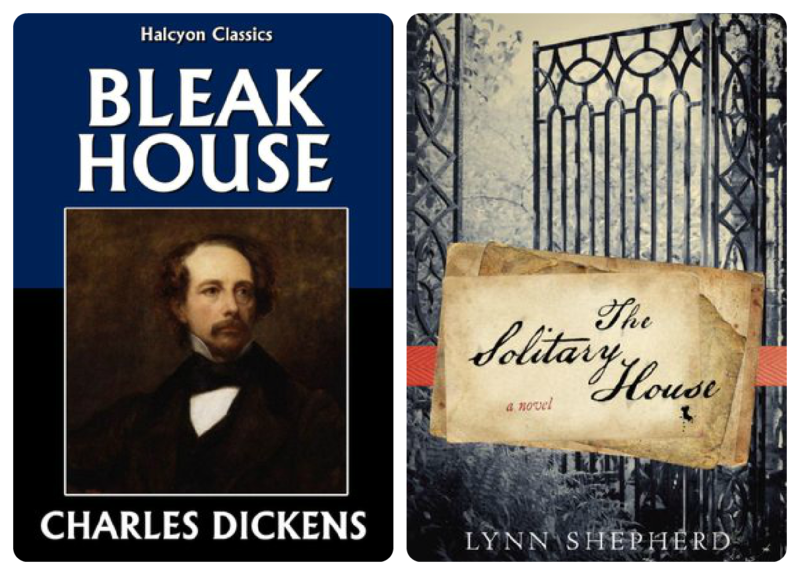 Also, The Solitary House by Lynn Shepherd seems extremely interesting and it's based on places and characters from Bleak House. Her 10-minute video explaining her book was pretty cool. Now what about you? Do you have a special formula when reading more than one book at a time? Above are the stories I'd like to tackle over the next few months. Lounge-like reading and all. I'm still plugging away at the STAND as well; enjoying it but man......sometimes I need to read something else. Hope u r having a great summer. I usually have one book in print and two audios - one on my phone and one in my car - going. So far, it works for me. I am not very good at reading more than one book at time. I have two on my kindle right now. Possession and The Toilers of the Sea, both chunky reads. I stopped reading them both to read a chick lit book, and now I am back to Toilers. I usually find that one dominants the other and I finish it first although I am not reading as much on the kindle as I would a physical book. This is a great recipe and I'm glad it's enhancing and enfunifying (ha!) your reading. I can usually do two books successfully. Three makes me feel slooowww. I have absolutely no strategy! Ha! I do read one print and one audio, and it does help if the two are not similar (2 women's fiction, 2 murder mysteries, etc.) because I get confused. Other than that, I just blunder into my reads. I got a new phone that does more, so I've got an audiobook going on my phone (All Cry Chaos by Leonard Rosen), an audiobook on my iPod (Bossypants by Tina Fey, v. funny), an ARC from NetGalley on my Nook (Garment of Shadows by Laurie R. King, a follow-up to Pirate King), and two nonfiction books for review, The Reader's Advisory Guide to Horror and an ARC of Happier at Home by Gretchen Rubin. I think this is a record for me of number of books going at once, and here I am reading blogs instead! It definitely helps that these books are all completely different from one another. Just can't do it! Admire those who can though. I have to finish the book I'm on before starting another. Unless of course, I'm not enjoying it. If it has not grabbed me by page 50 I have no qualms about abandoning it. I always have at least one audio and one or two print going at the same time. Sometimes I'll toss in some non-fiction and spread it over a week or two. No real strategy to any of it. I read The Unlikely Pilgrimage of Harold Fry without putting it down for another book. I had to know if Harold finished the journey. My formula is kind of new, too, but it looks like it's going to work. Oh, I was going to say that I loved Bleak House, but I'm not sure I would recommend that anyone make it their first Dickens. But it sounds like you've got good reason. Just be patient in the beginning. For everything to work, bleak has to be pretty bleak for quite a long while. I have a similar rotation for my books too! I've just started The Iliad, plus I plan on reading Nox which is poetry, along with a short story collection. Happy reading! Just finished a readalong of Bleak House which forced me to read it slowly, 70 or so pages a week. It was great - I never got bogged down and taking some notes allowed me to keep track even spread out that long. I like having different books going at the same time for variety and liveliness too. makes reading seem less of a chore sometimes, especially reading for review. I adore that graphic you made -- so pretty! I can't do audiobooks -- not sure why, it just doesn't click for me! -- but I do enjoy juggling multiple reads. It helps when I'm working through review copies -- esp if I'm not wild about one. My commute is long enough I can finish a book in about two days and there's nothing worse than being stranded on the train with nothing to read -- so I always have two or three books in my purse! 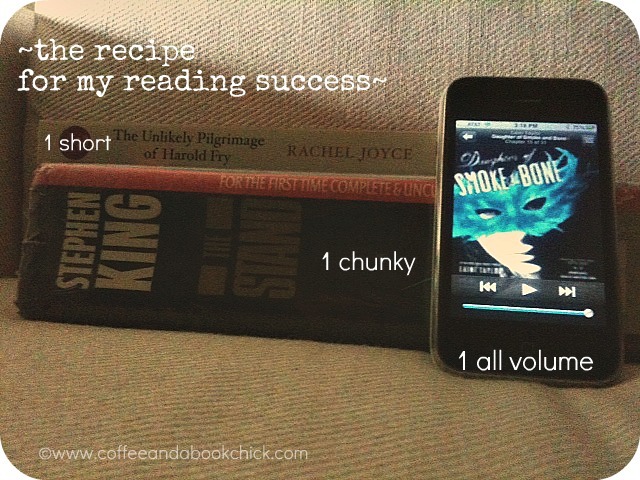 My formula is 2 or 3 audiobooks, and one lengthy book in print. but I like the print book to be full of excitement and movement, making me want to turn the pages faster and faster. As for audios, I like to have one fiction that is slightly more challenging, one comic, and one that is non-fiction. In this way, I can move through many genres and types of books, and it keeps my mind active at all times. I've never thought of this as a formula before, but it does work for me! Good luck with Bleak House. I tried watching the BBC adaptation but found it dull. And I'm struggling with the book also.. I like this. I usually read a few different books around the same time. In case, one turns dull I have still have the others to read. I'm like Sandy...strategy-less. Right now I'm 100 pages into Shadow of Night, but I want it to last forever, so I've detoured into Patricia Briggs. I was thinking of you today when I read that 11-22-63 won the hardcover best book for 2012 at ThrillerFest and your King challenge! If it were not for you, I'd never have read that book and oh what a book it was! 11-22-63 is still by far my favorite book for the past two years! Now, in answer to your question ~ nope, I'm consistently unable to keep more than one book going at a time. As much as I want to, try to, wish to, I'm simply not capable. And I love to read the chunkies! So when I have one of those going on then I'm out for a while on any other books....oh, wait, I take that back! I CAN listen to a novel as I'm reading something else....forgot about that! Great question Natalie! I am going to pose this question to my readers as well. It is interesting to me since I swore that there was no way that I could read more than one book at I time and never did, until recently. As a blogger, taking on those chunksters are something that I don't want to pass up, but it leaves a big gap in between review post if I don't read more than one at a time. I participated in The Stand read-along and read other books at the same time. The beginning nearly killed me, since there were so many character introductions, but in no time at all, I was easily juggling more than one book at the same time. Your advice to keep the genres very different is good advice indeed. Happy reading. I usually have four print books and two audios going at the same time - not counting anything I'm reading to my kids. And like you, the most important thing is to keep them all from different genres. I can have a mystery, a sci-fi, a historical, and a contemporary going at the same time, and not get them mixed up. Same thing with audio - I'm currently listening to Anne of the Island, a reread for me, and Language of Flowers, which is contemporary. Completely different in time period, style, and narrator. I always read more than one book at a time and I like them to be very different. 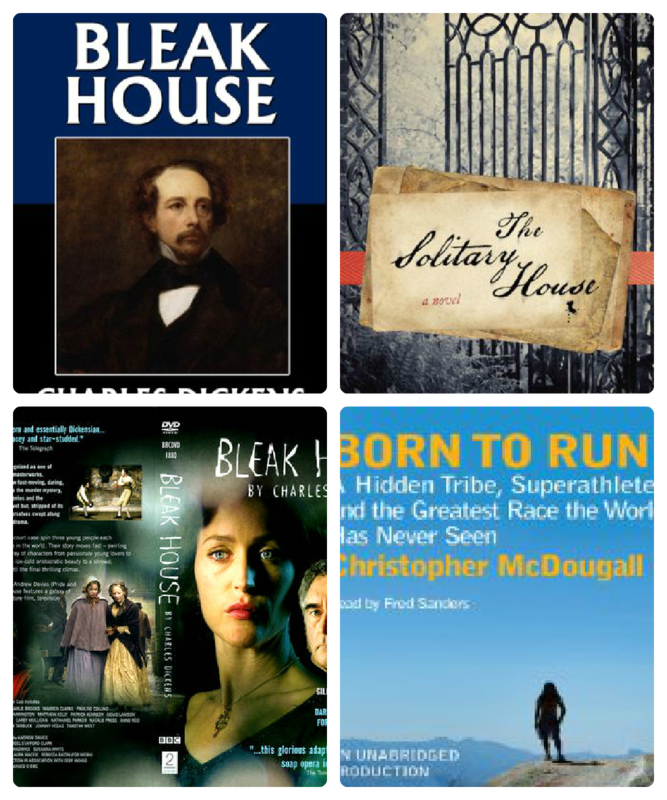 I'll pick a big classic, like Bleak House, and pair is with a modern mystery, like The Shadow of the Wind, and then maybe a fantasy book like Gaiman's Stardust and top it off with a nonfiction book, perhaps something by Mary Roach or Sarah Vowell. That way there's no plot confusion and I feel like different parts of my brain are at work. I'm reading THE SOLITARY HOUSE now Natalie. Haven't read BLEAK HOUSE yet, but I have it here in a nice hardcover edition. But I just have so many other books waiting that it's always a toss-up. I like your thick, less thick, audio combo. Makes sense to me. I've got THE MOONSTONE here and I'm picking at the pages slowly. Though SOLITARY HOUSE and MOONSTONE are set in the same era, so I broke the rule going in. Bleak House: bought this several years to read before I see the miniseries. So let me know when you are ready to read and I will join you. Apparently I need a push to do these things. The Stand: Natalie, this book is killing me. No spoilers, but I am skimming the rest of this book. If it wasn't for the read-a-long, I would have tossed this sucker. As far as having several books at the same time, yes I agree with some chunksters I like to start another book to change it up now and then. I do have a few chunksters hanging out there that I would like to finish, but when I pick them up, it's amazing, I remember exactly what's going on. no problem. Sounds like a good reading strategy. I'm currently reading The Stand and also listening to an audiobook in the car so now all I have to do is mix a short book in there and I'll have the formula down!